Any time an individual is considering a new job, they’re deciding which interviews to pursue, evaluating whether a role aligns with their career goals, and debating the best approach for landing their ideal compensation package. With over 10,000 companies and a marketplace of over 2 million job seekers, we’ve come to understand that these factors make up a larger set of considerations that tech talent evaluates when they choose to join a company. 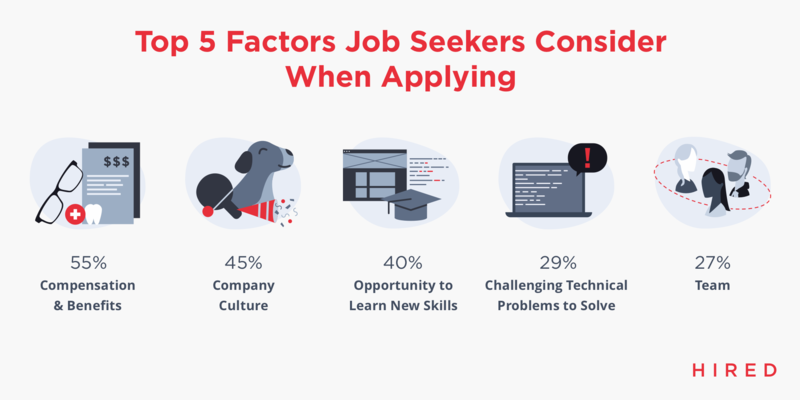 To bring clarity to what matters most to job seekers, we asked tech workers which companies they’re most interested in working for, what attracts them to an appealing employer, and what drives them to accept or reject a job offer. 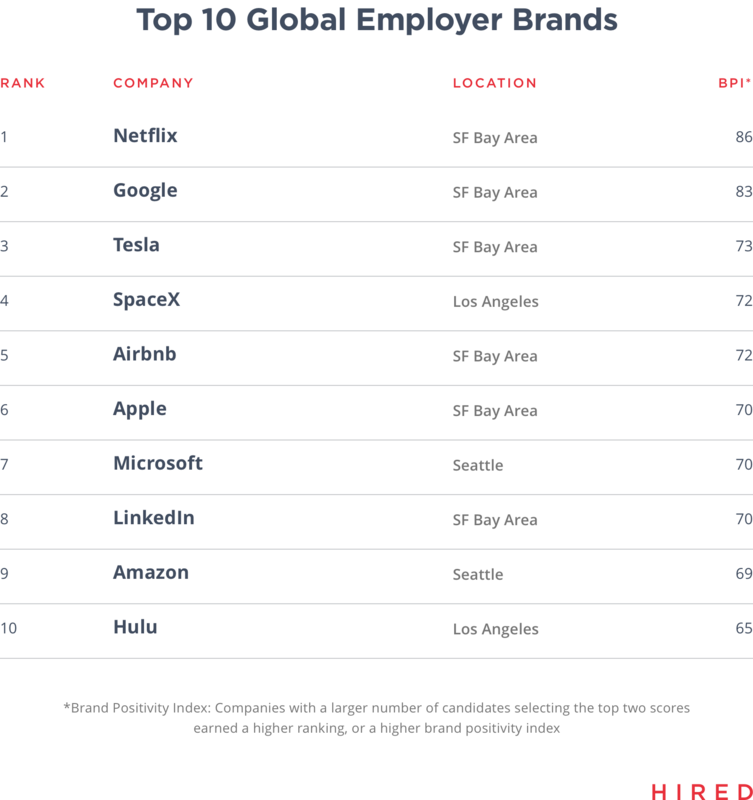 Our second annual Brand Health Report recognizes companies who have been named a top employer brand by tech talent and provides insights that help companies improve their talent acquisition strategies to better attract and retain top talent. To gain a deeper understanding of what job seekers value in an employer, we asked our marketplace of tech talent to rank the companies they’d most like to work for. This year respondents named Netflix as the most appealing place to work with a Brand Positivity Index of 86, moving up the ranks from fifth place last year. Directly behind the media streaming giant is Google, Tesla, and SpaceX. 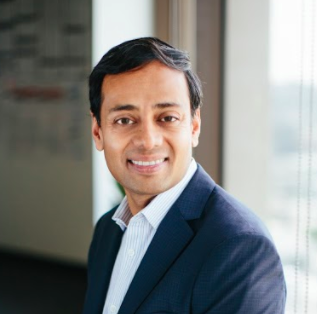 The report also reveals a promising footprint of innovative companies like DeepMind and Virgin Hyperloop One that are standing out to candidates on a global scale. We’re noticing that companies who are innovating in their industry while sharing their vision for the future are getting noticed. We also found that tech talent increasingly looks for roles where they find meaning in their work to make an impact. Respondents also had the opportunity to rank the companies they found most attractive to work for in the market they live in. 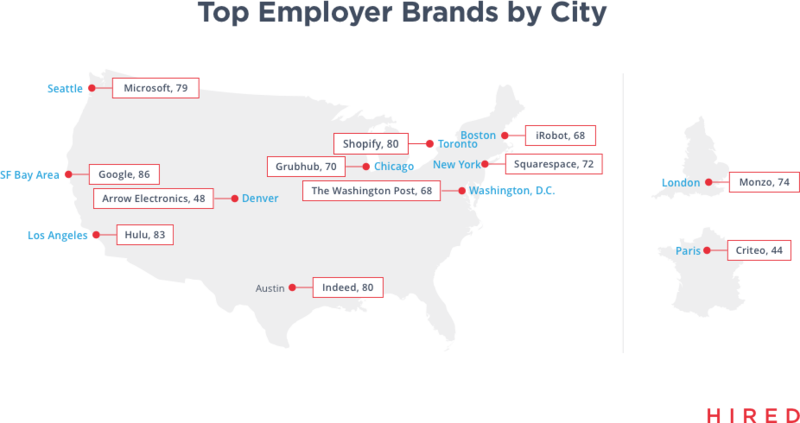 We found that consumer tech brands dominated the local lists, including Grubhub in Chicago and Hulu in L.A., while media and enterprise companies, like The Washington Post in D.C., and SendGrid in Denver, scattered throughout the local top-10 rankings as well. It’s no surprise that compensation and benefits (55%) rank as the number one factor job seekers consider when they’re evaluating a job opportunity, although company culture comes in at a close second (45%). For companies who are unable to compete with tech giant salaries, it’s critical to focus on what you can offer to a candidate who joins your company. Showcasing a strong company culture and opportunities a candidate will have to develop new skills in their role will be impactful during the recruiting process. The old saying “people don’t quit a job — they quit a boss” rings true in our findings, too: 37 percent of candidates agree that feeling undervalued by a manager is a driving factor to quit. 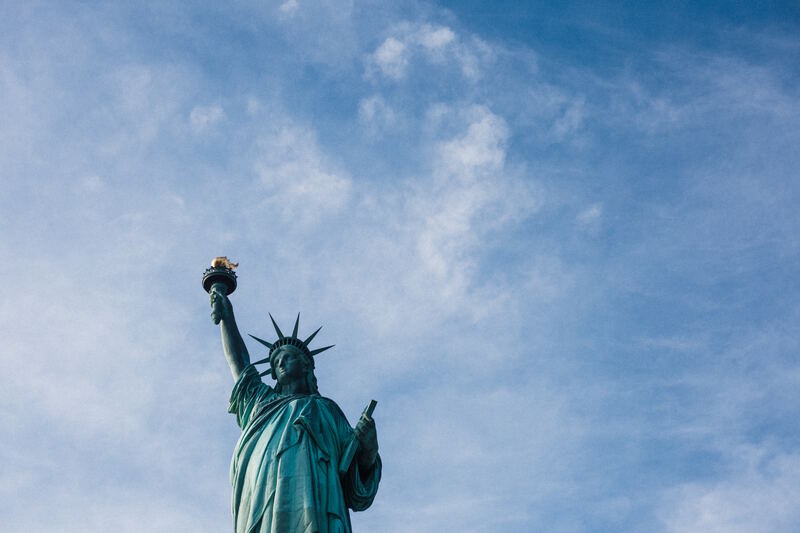 Nearly three out of four respondents also said that higher base salaries will influence them to take another job, and one in four respondents said that a better title plays a role as well. Employees reveal that they also consider location, commute, and opportunities to learn something new when evaluating job opportunities. 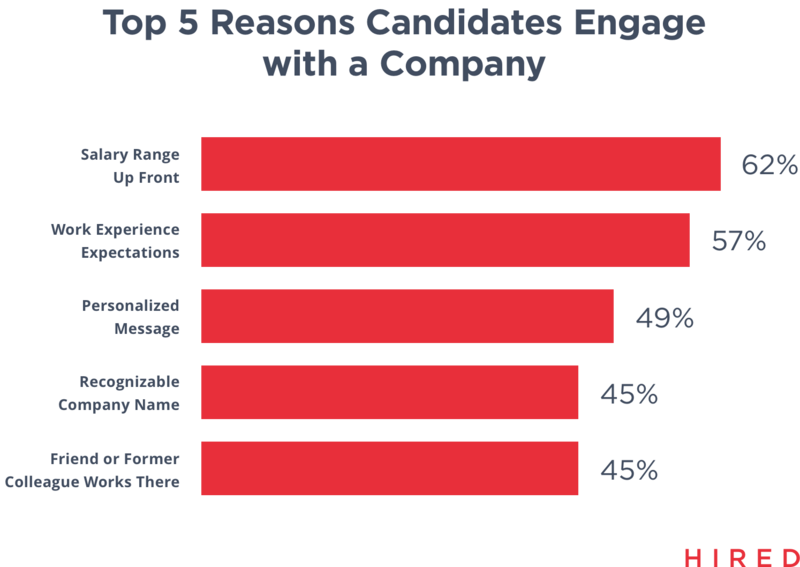 To help companies understand what’s working well for top-ranked employer brands, we looked at the top five reasons candidates engage with a company — and the key word is transparency. Born out of a broken recruiting system, salary discussions have often been perceived as taboo and take place at the end of the hiring process. 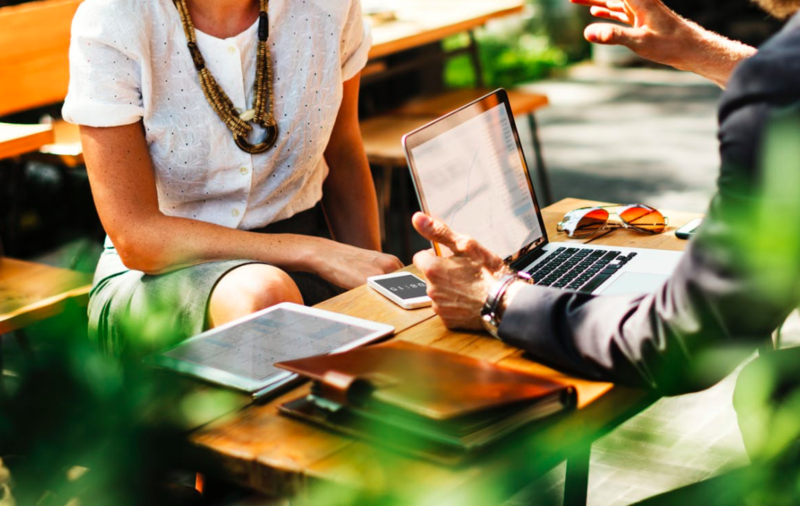 Our philosophy is that compensation should be a part of a company’s very first conversation with a candidate, and an overwhelming 62 percent of our survey respondents agree. Provide opportunities to change tracks: Our report revealed that candidates in all markets are seeking ways to advance in their careers. More specifically, when applying for jobs, 41 percent of respondents look for training and development options, and 64 percent move on when another company provides a chance to solve new problems and challenges. Send personalized notes: Similar to data showing that handwritten letters can improve your chances of landing the job, our data shows that sending personalized notes to candidates can go a long way too. Forty-nine percent of respondents say they’ll engage with a company that sends a personalized note — and that personalization is 12 percent more important to women. Offer remote work or flexible hours: With 70 percent of survey respondents expressing interest in working 100 percent remotely, flexible schedules are clearly important. These figures reveal that in order for companies to remain attractive, they’ll need to adjust their benefits to cater to the high demand. 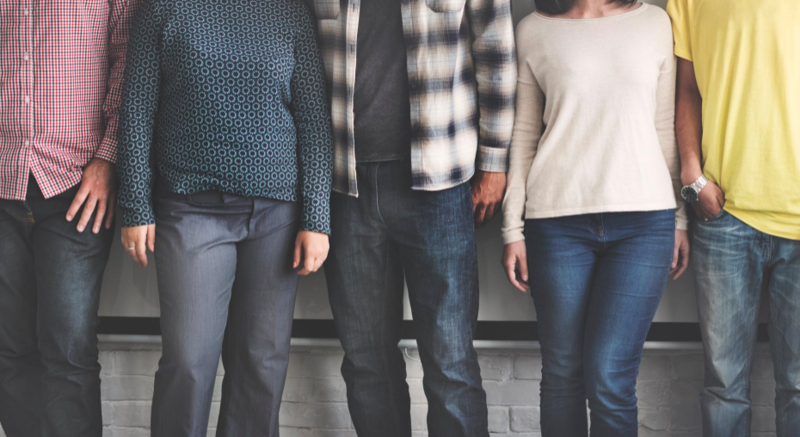 Great people are the foundation of every successful company, so the importance of building a strong employer brand is the cornerstone of a strategic talent acquisition strategy that helps attract top talent. From providing tech talent opportunities to advance their careers, to sending personalized messages during outreach to show thoughtfulness, every touch point a candidate has with your brand — online or in-person — reflects what a company believes in and presents an opportunity to leave a lasting impression.